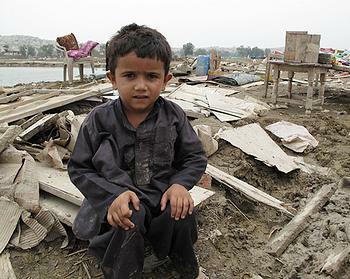 ISLAMABAD, Pakistan, August 12, 2010 (ENS) – While assistance is being provided to hundreds of thousands of Pakistanis affected by the country’s worst flooding within memory, the United Nations humanitarian office says relief supplies are reaching only a fraction of the millions who need help. In a new report today, the UN Office for the Coordination of Humanitarian Affairs says that more than 14 million people, almost one in every 10 Pakistanis, are affected by the flooding, which began in late July due to heavy monsoon rains. The official death toll has risen to 1,343, with 1,588 people now reported as injured. At least two million have been left homeless and over 722,000 houses have been either damaged or destroyed, according to the latest report from the national and provincial disaster management authorities. The threat of water-borne disease and dehydration is of increasing concern, the humanitarian report warns. Food assistance is also a high priority. Of the 14 million people thought to be affected, teams from the UN World Food Programme estimate that six million are in need of food assistance. Rapid food needs assessments have been conducted in 11 districts of Khyber Pakhtunkhwa, KPK, which identified 2.6 million people in need of food assistance. WFP assessment teams are now conducting a similar assessments across affected districts of Punjab, and will move into Sindh on August 14. 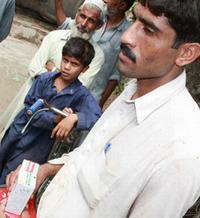 Food distributions are expected to begin in identified priority districts in Punjab, Sindh and Baluchistan in the next few days. The Pakistan government has offered WFP the use of six helicopters to transport food to tens of thousands of hungry and desperate people in isolated communities across the Swat Valley. A WFP team has been in the Swat Valley identifying safe locations for the helicopters to land. “In this scene of devastation, with roads cut and bridges washed away, these helicopters are literally life-savers as they are the only way to get vital food supplies to many thousands of hungry and desperate people,” said WFP Executive Director Josette Sheeran. There continues to be an urgent need to scale up both assessments and response in Punjab and Sindh provinces, finds the UN Office of Humanitarian Affairs. Details on the extent of the damage across Sindh and southern Punjab provinces are still being established. Data currently available indicates that Shikarpur, Thatta, Kashmore and Khairpur have been the hardest hit districts in Sindh. The northern part of Sindh province is flooded and the provincial government has evacuated more than half a million people. The Pakistan Meteorological Department has issued warning of fresh floods in low-lying areas of Sindh along the banks of the Indus River in the coming days. Water levels in the river are rising at Chashmabarrage, which is likely to affect several districts of the province over the weekend. The Department has warned that low-lying areas of Khairpur, Jacobabad, Ghotki and Sukkar Districts are at risk of further flooding. A Pakistan Initial Floods Emergency Response Plan requesting a total of almost $460 million was launched Wednesday at the United Nations Headquarters in New York. UN aid agencies and their partners requested almost $460 million to help Pakistan address the needs of flood-affected families, including by providing food, clean drinking water, tents and other shelter and non-food items, as well as medical supplies. In Khyber Pakhtunkhwa province alone, 80 percent of the water systems are polluted with silt and other runoff, says Martin Mogwanja, UN humanitarian coordinator for Pakistan. So far, donors have committed or contributed $47 million to the response activities, and a further $99.5 million has been pledged, but the UN says at least $300 million is still urgently needed. “We have a huge task in front of us to deliver all that is required as soon as possible,” UN Emergency Relief Coordinator John Holmes said during the launch of the emergency response. The nonprofit aid agency Oxfam says “there is a desperate need for temporary shelter, clean drinking water and toilets to avert a public health catastrophe.” People also need medical care and basic food items. Affected people were already desperately poor and what little possessions they had have been washed away, says the aid agency, which is evacuating thousand of people by boat, trucking water, installing tanks and building emergency toilets to help prevent the spread of water-borne diseases. “The extent of this crisis is only slowly emerging. Rain has continued to fall in some areas, flood waters are still moving south, and the more villages that are reached the grimmer the picture becomes,” says the agency, which is trying to raise $6 million to respond the the needs of flood survivors. 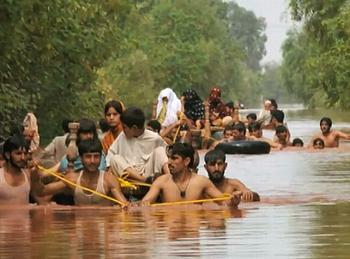 The United States has provided about $76 million to the flood-affected people in Pakistan. This morning, U.S. State Department spokesman Mark Toner said the U.S. government is providing an additional $4.1 million to Save the Children to be used for food vouchers, enabling flood victims to purchase food in their local markets. Two U.S. Marine Corps Super Stallion helicopters were en route to Ghazi Airbase in Pakistan today in support of flood relief efforts, but Toner said they had to be diverted to Chaklala Airbase near Islamabad because of the weather. These two aircraft are the first of 19 helicopters that were ordered to Pakistan on Wednesday by U.S. Secretary of Defense Robert Gates. Today, the European Commission adopted a 10 million euro emergency decision to further assist the most vulnerable people in Pakistan affected by the floods. The aid decision takes immediate effect and comes as an addition to the 30 million euros allocated by the Commission for humanitarian assistance on July 30.